Choose any (or all!) 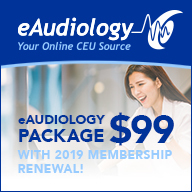 of the web seminars in the eAudiology library (nearly 200 to choose from). Presented by: Andrea Warner-Czyz, Ph.D.